FA CUP: Tigers ‘keeper scores dramatic equaliser with a last-minute overhead kick! Action from Deeping Rangers against AFC Rushden & Diamonds. Photo: Tim Wilson. The magic of the FA Cup became a reality for Holbeach United goalkeeper Ricky Drury yesterday (September 26). The Tigers looked beaten as they went into added time against National North side Worcester City at Carter’s Park. The visitors led by a single 70th-minute Lee Hughes goal when Holbeach were awarded a free kick just inside their opponents half. Drury trundled forward, no doubt more in hope than expectation, but he met the long-ball into the penalty area with a thumping overhead kick that sped into the bottom corner of the net. It was a magical moment that earned Holbeacj a place in tomorrow’s (September 28) third qualifying round draw. They face a replay at Worcester on Tuesday (September 29). Holbeach manager Darren Jarvis actually wanted Drury to take the set-piece, but he was glad he ignored his instructions. Jarvis said: “Special players make special moments in games and Ricky Drury has certainly done that. The fact he’s scored a goal with an overhead kick is amazing. Drury also made a brilliant save to thwart Hughes, a prolific Football League goalscorer in his heyday. Spalding joined their neighbours in the hat for tomorrow’s draw after easing to a 3-0 win at fellow Evo Stik Division One South side Coalville Town. The win guaranteed Spalding £4500 in prize money. An own goal, an overhead kick from Nialle Rodney and a late Josh Moreman penalty enabled ‘The Tulips’ to make it to the third qualifying round stage for the first time in 11 years. They won’t be joined by Deeping Rangers though who slipped to a 3-0 home defeat at the hands of bang in-form AFC Rushden & Diamonds at Outgang Road. Holbeach are now the sole surving United Counties League team in the FA Cup. Fraser Sturgess came close to opening the scoring for Deeping, but the visitors, who haven’t lost in 31 matches, were 2-0 up by half-time and cruised through the second period. Stamford AFC were beaten 2-0 in their tie at Coleshill today (September 27). The home side scored early and late in new manager Andrew Wilson’s first game in charge of ‘The Daniels’. In the United Counties League Premier Division a scrambled effort three minutes from time from Declan Rogers gave Seb Hayes victory in his first match in sole charge of Peterborough Northern Star. Star beat Harborough 1-0 at Chestnut Avenue. 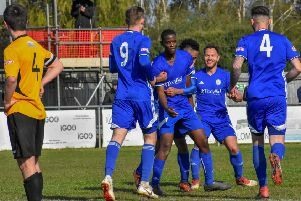 Yaxley smashed struggling Wellingborough Town 8-3 to move up to fifth place. The Cuckoos were 4-0 up inside 25 minutes and Tony Ogbonna went on to claim a hat-trick. Wisbech were 2-0 ahead through Chris Bacon and Stuart Cobb against AFC Kempston Rovers, but the unbeaten visitors fought back after the break to draw 2-2. Peterborough Sports are up to second in Division One after making it six wins out of six at Rushden & Higham. It took the city side 57 minutes to break the deadlock when Avelino Vieira scored the first of his two goals. Lewis Webb was also on target for a Sports side who are two points behind leaders Stewart & Lloyds with three games in hand. Blackstones are enjoying a fine season by their own recent standards and a 2-0 win at Olney took them into sixth place. Stones won their previous match 13-1 against St Neots Saints - a club record-equalling score as they also recorded a 13-1 success at Brackley in the 1993-94 season - but goals in the first quarter of the game from Addie Staffieri and Jordan Avis sufficed this time.